I have to admit that I was not a fan of sausage before I moved here. Calabrian salsiccia is really something special though, and this simple dish has become one of my absolute favorites. If you’re going to make this week’s What’s Cooking Wednesday recipe, please try your hardest to get some Calabrian sausage. The main flavor you should be looking for inside la salsiccia is peperoncino — hot pepper. Look at the photo below–see how red the inside is? That’s not undercooked, that’s piccante. And YUM. The recipe is super easy–just your basic tomato sauce really–so feel free to experiment, throw in some peppers, mushrooms, or whatever you like, although you probably won’t need extra peperoncino! I know a lot of people take the sausage out of its casing and crumble it into the sauce, but the method described below really lets the sausage shine. Keeping the sausage in its casings would also allow for the traditional Italian meal of pasta for the first course and then meat for the second course–although we eat it all together anyway. My American influence on P perhaps? 1. Heat about half a tablespoon of olive oil over medium heat in saucepan. 2. Poke holes in the sausage with a fork, add sausage to the pan, and and cook until browned on the outside, about 10 minutes. The sausage should also spring back from your touch a bit. It doesn’t have to be cooked through completely at this point as it will continue to cook in the sauce later, but you do want it mostly cooked. 3. Add another half a tablespoon of olive oil if the pan is dry; it may or may not be depending on the fat content in the sausage. Add onions, garlic, and parsley and sauté without letting them burn; you may have to turn down the heat a bit here. 4. Optional: Add wine and let cook off. 5. Turn the heat down to low and add tomatoes (put through a grinder or chopped to your liking), about a 1/4 cup of water to clean out the can, and salt to your taste. If sauce is still too thick, add some water; we often add up to 1/3 cup depending on the tomatoes. Cover and let simmer for another 10-15 minutes or until the tomatoes are done to your satisfaction (including proper thickness of sauce). If the sauce is too thin, let it cook for a bit without the lid on. 6. Prepare pasta and toss well with sauce. You could add some grated cheese, but I think this is delicious without. That sounds soo good! I just had breakfast & really don’t need to be thinking of food yet. Prima and seconda all together, eh? Next, I suppose, you’ll be having him drink coffee with milk. After lunch. Simma da na. P will *never* drink milk in any form before or after lunch…although he did try my American coffee with milk once and didn’t spit it out, so…. Funny, I too was no fan of sausage until I tasted the sausage here in Abruzzo. I think it may be the black pepper they put in sausage in the US. As for the sauce I like cooking the sausage in it too and I’ll usually crumble up one small piece and leave the rest whole. It’s yummy. I’m going to have to make some soon before they stop making fresh sausage. Since Dad is arriving on Saturday I’ll treat him to this! Ooh perfect timing Joanne! Benvenuto Papà! I will sure give it a try, it looks delicious. We love spicy, and pasta, so it will sure be a hit. We love spicy and pasta too…but I guess you probably knew that 😉 Let me know how it goes! Once again, you’ve offered up a recipe that I must make! I tried the fried eggplant balls the other weekend….YUMMY!!!! Jane’s last blog post..What is your excuse? I love Calabrian spicy. Northern Italian couldn’t touch it. And I loved your comment on my post yesterday. I knew I would ruffle feathers with that post, but you always seem to know exactly what I’m saying. Very rare. Thanks. “Spicy tooth!” That’s wonderful! Anch’io l’ho! I think I’m going to have to take a sausage tour of Italy. Hmm, that sounds dirty. Hey there! Me again I wondered why your cute little thingy didn’t pick up my last post like it usually does (I love that). But I guess I’m having one of those days. Can I come round to supper at your place? Pleeease. And supper will be around 7.30…hurry! I was never much for sausage before coming here, either. Each region’s is different; here is definitely milder than southern Italy. When I buy the salsiccia piccante at our butcher he always asks, “well, was it spicy enough?” When I say, “it was mildly spicy” he laughs and says, “nothing’s ever hot enough for you!” This recipe has been one of my old stand-bys for a couple of years, since I first tasted it in a down-home restaurant in Agropoli. Yum. I promise I’ll hunt down some Calabrian sausage for this one. Oh, my! I’m not a big fan of sausage unless it’s fried heavily and served beside two eggs and a couple slices of toast, but I have to admit that that looks delicious! Can’t get them spicy up here, but they sure are salty! I ran into a Calabrian recipe today that I’ve never heard of. It’s a primo. I will have to look up the name ans see if you and/or P knows it. Looking forward to seeing that recipe, and whoo boy, let’s not talk about salt. The salt in the sausages seem fine to me (someone who is sensitive and not too fond of salt) but just about everything else made outside my home…wow. Mmmmmm! Me like spicy! Wouldn’t have called myself “masala” otherwise. And even if Mimmo is from the north, he was either calabrese or Indian in another life because he can out-spice me any day. He turned me on to ‘nduja and could hold his own when he visited my relatives in India. And I’m sure he’ll loooove this recipe. Linda’s last blog post..Milanese Expo!!!!!! That’s funny about Mimmo and ‘nduja! My P doesn’t even really go for that very often…. It looks great, although I can’t do the hot sausage. But I’m sure the sweet one would work just as well. I love the simplicity of the dish. And the flavor is most assuredly “complex”. That’s whats great about Italian food! I’m sure you’d love this Marie; give it a go! 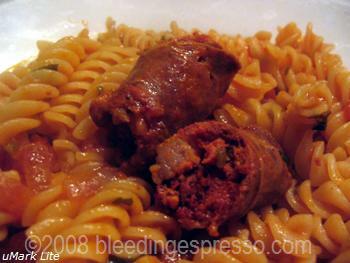 I remember having Calabrian sausage and salumi in Italy and being barely able to take the spiciness! I must admit, after a bit of getting used to it is addictively good! Love salsiccia. My favorite local Neapolitan pizza parlor uses it and it’s just so very yummy. That sounds lame. But the fennel and spice in the salsiccia really made the pizza stand out. Actually I’ve had fennel in sausage here; I think it just depends on who makes it…it’s never been an overpowering flavor in sausage I’ve had here, though.